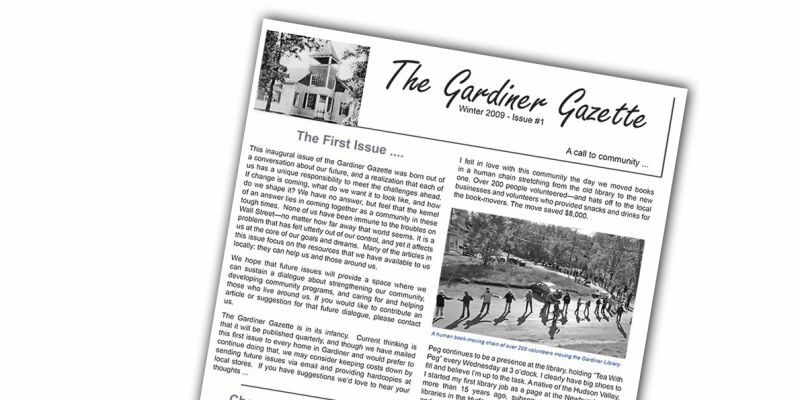 Ten years ago, in the winter of 2009, The Gardiner Gazette published its first issue (at right). It was shy on pictures. There were a handful of ads in it, all of them the same tiny size. We had no idea that it would last more than a few issues, but here we are. The old saying that the way to eat an elephant is one bite at a time is true here, too. We put our heads down and got out one issue at a time. If you try to think into the future too far, it just doesn’t seem doable. Our Editorial Committee was fairly stable for eight of the ten years, and now we have lots of new faces and lots of new energy. We have loyal advertisers, regular contributors, and generous donors. Thank you, residents of Gardiner, for your enthusiastic support. Will we still be here ten years from now? Hmmm…time for a meeting about the next issue. Let’s just focus on that!